So often in life we hear about a once in a lifetime buy, or a once in a lifetime opportunity. So often the reality doesn’t meet your expectations. Well this particular car is one that may well live up to the hype if one thing that I spotted turn out to not be an issue. 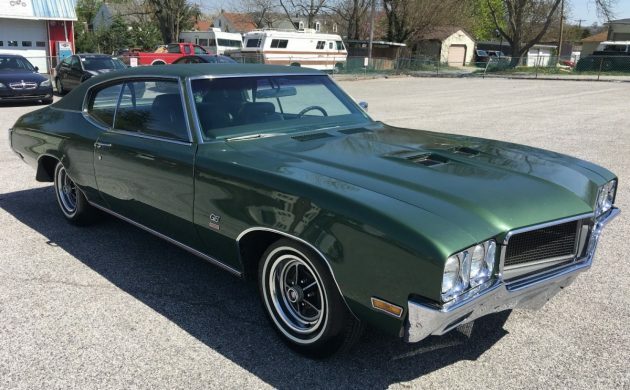 This 1970 Buick GS is not just a beautiful car, but it has a documented history that I would say is second to none. For sale with a clear title here on eBay, this genuine survivor is located in York, Pennsylvania. The starting bid for this beautiful GS is $20,000 but there is the option of a BIN of $35,000. The first thing that I will say is that I think that the seller is probably a flipper, as he currently has three other cars listed on eBay. That being said this is one fairly special car in my humble opinion. The seller purchased the car off the original owner who was a 94 year old gentleman. As you can see from this photo it appears that it has been lovingly cared for. That gleaming paintwork is said to be original, and has never had any repair work performed. The car is also said to be rust-free. 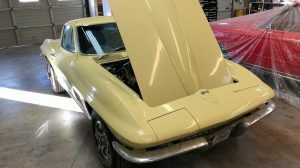 The seller has undertaken to update the auction post with additional photos of the underside of the car to verify this. When I said that the documentation was second to none, this was no bold claim. This shot shows just some of the documentation. Not only is there the original Protect-O-Plate, but there is also the original Bill of Sale showing that he traded his 1951 Buick Riviera on this car. If that doesn’t impress you enough, there is also the original Bill of Sale from when he purchased the original Riviera in 1951! Add to this the original PA title, the owner’s card, warranty card and the original Mount Joy Buick dealer decal on the trunk lid and I think that you have a pretty decent set of documentation. The interior presents in the sort of state that you would expect from a well cared for and cherished car, even one with 90,000 miles on the clock. 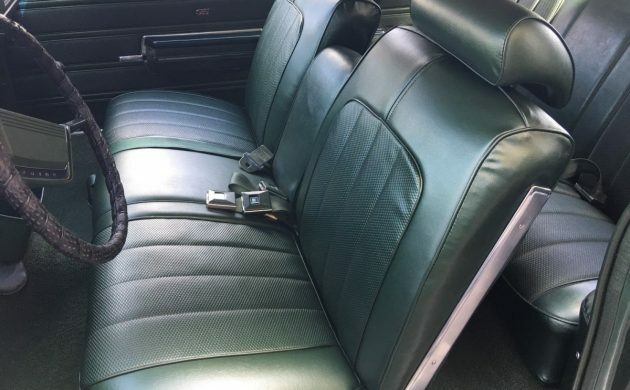 The only thing in there that is not original is an admission by the seller that the driver’s seat has been repaired due to wear from the original owner. Apart from that and the wrap on the wheel it is really hard to find fault in here. The back seat looks like it has never been used. Under the hood resides the 350-4V. This is backed by an auto transmission. By and large it all looks good, but I am a bit perplexed by the discoloration on the passenger side near the plastic expansion bottle. I can’t quite work out what the deal is there. I’ve even tried magnifying the image and am none the wiser, although it does bare an uncanny resemblance to bare metal. 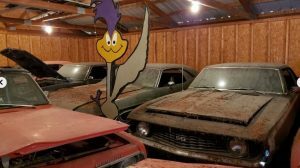 It will be interesting to see what our Barn Finds readers make of that. 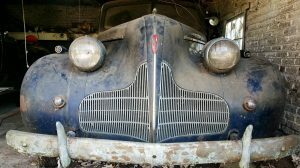 I found it really interesting when scouting around the internet to see what was out there similar to this particular Buick. I could find plenty of them with the 455 fitted, and I could find plenty of convertibles. A GS with a 350 doesn’t seem to be quite as common, so comparing prices is quite difficult. 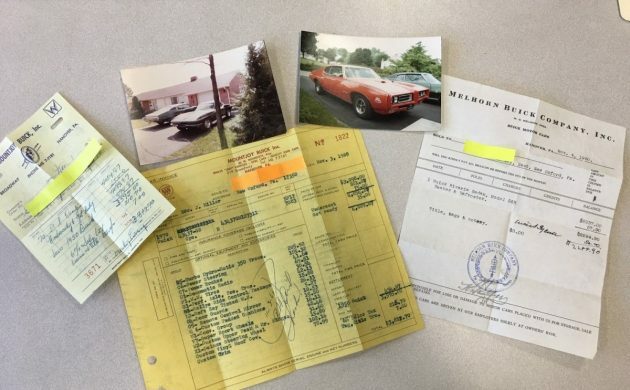 My own personal opinion is that if the car stacks up to be as good as the seller indicates and if that flaw that I questioned under the hood is no great issue, then this would be a rare opportunity to own a car with such an unusual level of documented history. Is it worth the asking price? If I were a betting man I would bet that someone will pay it. Green on green, holy cow, there went my objectivity. With 90K on the clock, drive it. Conserve it and maintain it, but drive it. That said, I’d pay $20k but probably not 35k. Hard to believe that car is 48 years old. This is a small block car and seller wanting big block money. 20000 is on the high side 35000 is a joke. The “bare metal” on the passenger inner fender looks like it could be that someone poured brake fluid in the reservoir nearby instead of the master cylinder. Maybe that’s why they took the old man’s keys away. Love all the docs and old photos. Looks like he was quite a performance fan judge-ing by what he parked next to back when. The opening bid might be in the ballpark, not $35,000. It’s a low option GS350 with a column shift and a not particularly popular color. I don’t see any heater hoses in the engine picture, and the master cylinder looks like it’s for drum brakes. I also wish he included pictures of the areas behind all four tires and door jambs, the way the pictures were cropped and the angles selected it almost seems like rust prone areas might have been intentionally avoided. It seems like a nice car, but after 48 years and 90,000 miles an thorough inspection would be needed. At the sellers price point, there are many more interesting option available this car will be a tough sell. Even a flipper should replace the tires from the “as found” paws. To me, raised white letter T/A Radials would improve the looks and I like the dark green. But the lack of air and having a column shift is a real buzzkill for me — and I love Skylarks of this era. Are we looking at the same car Hammy? It’s almost 50 years old! I agree with all the previous comments, enough said. 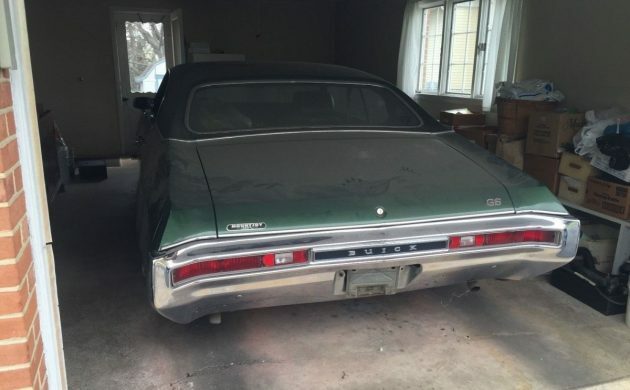 Seller to elderly owner: ” Gee I don’t know………$2500? Its pretty old……….would you take $1750? That bare metal looks like it has been ground down. Maybe some body work that wasn’t finished? 35 k for a 350 car, i dont think so. i have a 70 455 gs convertible with cold a/c buckets and console that i would take 35k for if i was to sell it. The perfect GS. A 70 350-4 and triple GREEN!!!. On of my favorites. Would love to have this as a stable mate to my 70 Seamist Green Skylark Custom. It might be me but, I don’t see lines coming out of the master cylinder ???????? They run back almost behind the booster. Victor, enlarge the picture and you can see the brake lines going back toward the firewall. I think $16,500 sounds about right. If he thinks he’s gonna get 35k, he’s huffing paint fumes. Nice but what does Kieth think ? Just a nice Skylark, nothing more. The 350 is adequate. This is what things came to because of insurance companies rate gouging. I’m surprised they didn’t charge higher rates to cover the hood and air cleaner. didn’t these things have almost 500ft/lbs of torque? The stage 1 455’s did not the 350’s. Price is optimistic. 20k car at best. That bare metal is awfully close to where the battery resides…I’d suspect it exploded at some point and took the paint off. Hope the car finds a good home. if it had the 455 it would be worth it …. nothing compares to a big block ! Looks like a really nice car. 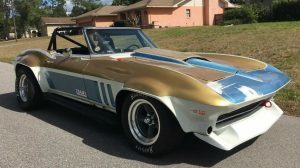 I don’t think it’s fair to assume some dealer stole it…lot’s of dealers will pay up for desirable cars, and old timers often know values as well as anyone else, and aren’t giving their cars away. Yeah ok a 455 Stage one will be a more desired car. But don’t readily dismiss this car because it is a 350. 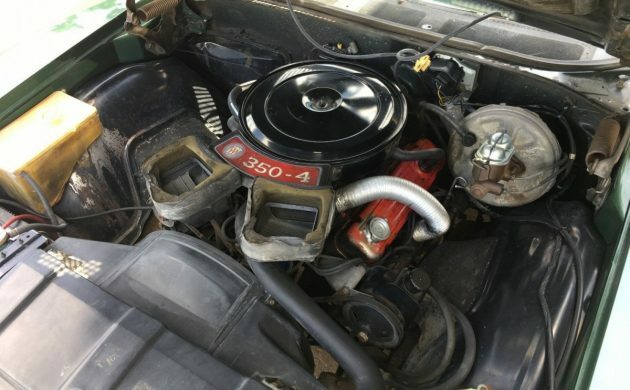 I had a 72 Skylark Convertible, put a speed shift kit in it, added dual exhaust had the Rochester 4 barrel rebuild at 108K miles when I bought it back in 1978 and that sucker would do 160MPH at least that is what i figured the speed was as it went past 120, D, N and R before I had to hit the brakes. Yeah I also had a column shift, seemed to work just fine. Only thing other than the price throwing me off is the color. I just can’t own a green car. Cool car and the market will dictate what it’s worth, although I’d say it’s a 12k car from where I’m sitting. 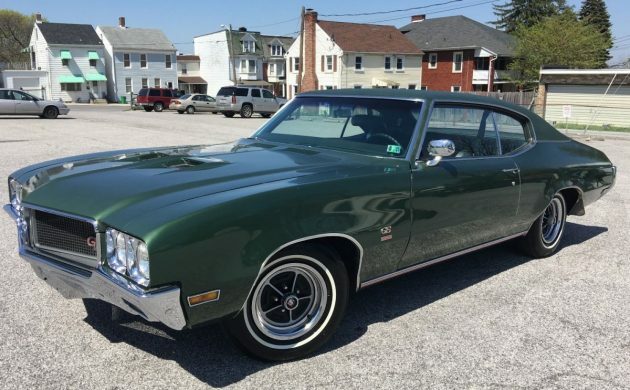 Low option and triple green hurt this one, but lets not forget the high compression ’69-’70 350 is no penalty box – people have pushed stock builds into the 12’s with just a little gear and convertor…IMO, the best looking GM A Body produced. Nice car. I had one of these only it was a convertible. That indeed is a drum brake master cylinder. The disc brake master is more rectangular. I do think I see a heater hose tobgge left of the air cleaner… no AC..
Two months late, BuickGuy! Post is from August 10th.